Birthday parties. We’ve thrown them, we’ve been invited. Being a parent for over a decade, my kids have attended dozens (hundreds?) of birthday parties. I don’t mean to sound ungrateful. Everyone is happy celebrating their special day. Everything was simple back in the day. Growing up in a family of six kids with a pack of neighborhood friends, we. had birthday celebrations for the whole year. It was simple cake and ice cream in the backyard, no fuss, no invitations, no special waivers or directions to places you’d never been. It’s only as a parent that I experienced the whole gamut of parties, from informal to complicated. You’d think by now I’d have the whole birthday prep mastered. I’m talking only about as invited guests here. The buying of the gift, the card, writing the party on the calendar, informing my kids whose birthday it is, etc. I’m afraid the passage of time has not garnered more efficient results. Things seem to deteriorate with each passing year. It doesn’t matter if I received two weeks notice for a birthday party, and in the meantime, I had been to Target a zillion times, I still buy the gift the day of the party. I give myself a huge pat on the back, if I manage to remember the gift the night before. One must not forget the wrapping and the card. If it were up to my husband, he would just plop an unwrapped present onto the gift table. No card, no bow, no nothing. Unwrapping a present is fun, is it not? Newspaper would be perfectly fine, although this seems to be a luxury we can’t afford and is not an available option. If you’re time-challenged like me, the most desirable method is to use that recycled gift bag you hope you still have. Reduce, reuse, recycle. Good for the environment, easy on the pocketbook. Everyone is happy, and this is why no one writes anyone’s names on the little tag that is attached to the gift bag. Even better if the recycled, gift bag happens to fit your selected gift. I know I’m really slacking it when my criteria for choosing a gift is whether or not it fits in that last bag that may or may not be laying in the closet. Did I just say that? No, I didn’t. Since, of course, I’m in a huge rush and have waited until the last possible minute to purchase a gift, didn’t check the closet and it’s the third birthday of the month, I determine that probably the only gift bag left is too small, and if I don’t buy a bag I’ll have to dig up some crinkled holiday paper…oh, I give in…I buy a bag!! To make myself feel better, I rationalize that I will be economical by NOT buying a card. 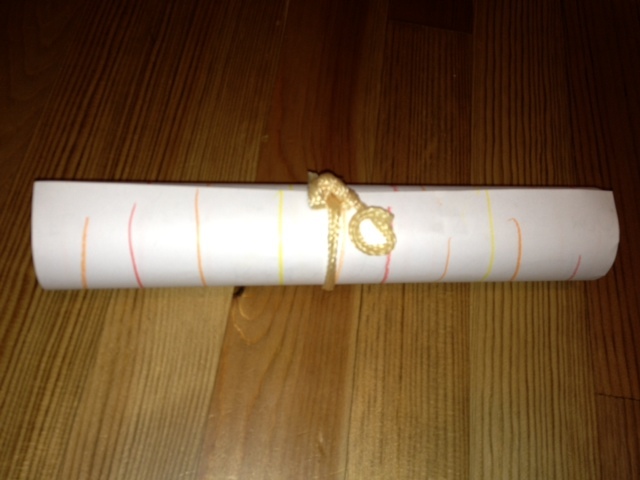 In a Mary Poppins moment I think…The children can make their own cards. Homemade cards are more thoughtful, meaningful, crafty, and creative. We still have a craft box in the cupboard, don’t we? This past weekend, my boys were invited to the same party, so I thought it would be reasonable for them to make a card together. The two of them could come up with one card, couldn’t they? Per usual, in the last, mad minutes, it was done in pencil with a couple scribbles and sign of the name, quickly without much thought. I began to doubt my decision about not going the store-bought route. “How about a little color?” I plead. “What about a little picture? A few flowers? Stars?” Anything…I only start to panic when I’ve forgotten exactly what time the party starts and where it is. The invitation is not on the fridge or anywhere, so it must be an Evite, and I now must relocate that. I think it’s perfect and I really do think so. So thoughtful of big brother to explain little brother’s absence. Aren’t we all just a little insane, after all? Final touches. Now it’s done up like a scroll. But, it’s not a bad idea. He may be on to something. P.S. I know all about the gift card, in case you’re wondering. Ha! Amy, such a great story and I love the homemade card thing. When my sisters had to do birthday parties, it seemed as if everyone had to have a present — not just the birthday girl/boy! I think that’s just weird. I’ve done that gift bag thing too — it’s so true. Great post! Thanks, Brigitte. I’m glad you can relate and I’m not the only one. I always think I have lots of bags, but then they’re not there! Luckily, the kids don’t care about the packaging too much. I personally love the homemade card even if it’s done in a hurry. It’s great to see you! My kids? Oh, they usually make a card. Probably about half the time at least. They’re not into crafts so much, but they’re surprised it’s so bad after all. “Things seem to deteriorate with each passing year.”—Isn’t that the truth?! What’s up with that, anyway? Are we just fatigued and burned out? I laughed while reading this because until a couple years ago, I experienced all too often of what you speak. I, too, was known to buy a gift based on whether it would fit one of my recycled gift bags. So glad to know I was not alone! And also so glad to know my kids are now at an age where birthday parties are infrequent. Phew. Carrie, I’m so thankful for your comments. Yeah, I probably burned out just a tad, but you know, I just want to laugh about it, too. It’s not that my intentions aren’t good and genuine. I just got a kick out of my son’s card. My friend, who read it aloud to the group of 4-year-olds, was not that amused by it! The birthdays seem to be slowing a bit, at least since my son is now in the double digits. Phew is right! I think your son’s card was perfect! Thanks, Carrie! I did give me a chuckle. Of course, you’re not terrible! Oh well, I LOVE my kids. I wouldn’t have it any other way. I think we all have moments when we feel insane. I think my child stated it perfectly. Thanks! I always recycle gift bags too, it’s crazy not to! For the last couple of years, my daughter (14) has taken care of the buying and wrapping of presents for friends herself, and that’s quite a blessing! With my son’s friends, I must admit to often taking the lazy route and just giving money in a card. When they were younger I always bought presents, but it’s so hard to know what to buy for 10/11 year old boys – everything they like is so expensive! It’s funny when they get to the 10 and above age, the gift card is the big prize. I guess, in my case, that’s not a bad thing! You can never get rid of those bags or the tissue. Let’s not forget the tissue. I don’t think that’s the lazy route by the way, especially if it’s what they really want anyway! It does get expensive. At least, as parents, we all get it. The kids don’t, of course. Amy, I laughed out loud many, many times reading this. 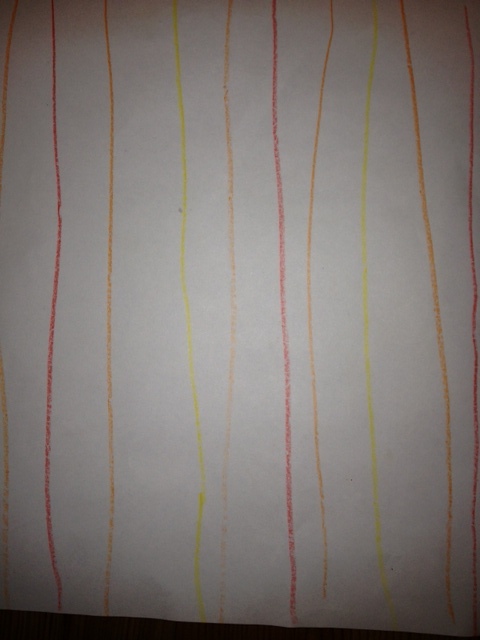 I loved the stripes on the back, Holden’s comment about why Skyler didn ‘t sign, and the rolled up scroll. Those three things surely were the highlight of the birthday, right? Maybe kids should run their own birthday parties! Ha ha!! I know you know! Can’t you just hear Holden saying this? Isn’t this card the best? I almost didn’t want to give it away. Yes, I think kids should run their own parties. I think that’s the answer to the Universe and everything. Thanks, Holly. You brought a big smile to my face. That is the perfect card, I think. As an elementary school teacher, I’d much rather get that than a store-bought card any day. I loved it. Thanks, David. I loved it, too. I wish my kids wanted to do cards more. It’s not exactly their thing, but when they do DO it, it’s always worth it. Kids’ birthday parties are certainly a “do” now. We finally got around to having twoonie-parties: each kid brings $2 (they are called Twoonies in Canada) for the kid and then $2 to donate to a charity of the kid’s choice. There’s not a lot of expensive, unwanted gifts to deal with and parents can feel good about going to so many parties because it’s not breaking the bank. Plus, we can always add a few more dollars in the envelope because it’s still cheaper than buying a gift. We also do the homemade cards — unless I’m running late and then we stop at the store on the way to the party. That’s such a great idea, iRuniBreath! It’s much easier when everyone in your birthday “circle” does it and everyone is on equal footing. Twoonie parties. What a great idea, Tania. I’ve never heard of anything like that around here. Canadians are just a more thoughtful bunch! Thanks for sharing that with me. It does start add up, hence the homemade cards, which if we can manage it, is a win-win! I always start with the best intentions as well (homemade cards, etc) and then time gets the better of me. No matter where it’s written down or how much advance notice I have! Aarghhhh! Love it, Amy! I used to hate that the bags and tissue cost so much. And, even checking the closet didn’t help unless I wanted to give a tricycle or deck of cards… I finally resorted to keeping a manilla envelope in the seat-back pocket of my car–it has small (blunt-nosed) scissors, tape dispenser, and scraps of ribbons (from opening other people’s presents, tee hee) along with flat-paper and cards from the charities we either do or do not support that keep sending them! Penguins, polar bears, pine trees, wolves, American flags are all single-sheets in that envelope. MY gift purchasing criteria include small-enough-for-a-single-sheet-of-free-paper and either box-shaped or able to be wrapped a’la the ubiquitous Tootsie Roll. Voila. Won’t IMPRESS anyone, but the kids don’t care and the other busy moms (or tree-huggers) in your life with be secretly jealous they didn’t think of it first. Well hi, Michelle! You are so organized. That doesn’t surprise me one bit. I think one day I’ll get it together, or not! Even better it’s in your car for presents bought on the fly. I’m impressed! Good for you, Michelle. This is making it work for you. I hope all is well with you. Amy, I’m SO last minute too! We usually stop by Target for a gift and the $1.00 Tree for a greeting card. 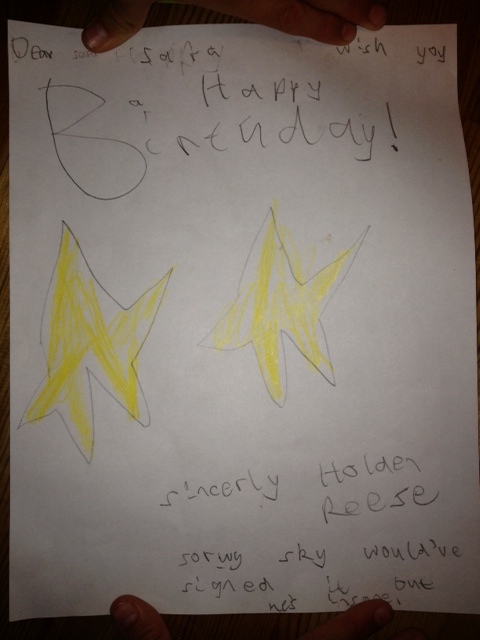 But now, thanks to Holden, I’m going to solicit my children to make birthday cards. Your little man certainly has a knack for being honest. I love it! Anka, I guess we’re just human! I’m happy if we make it to the party these days. No, I’m just kidding. I’ve been by the $1.00 tree store as well. It all adds to the total cost, doesn’t it? Not a problem if you’re not concerned with money. I only care about this, of course, because I have to. Thanks! 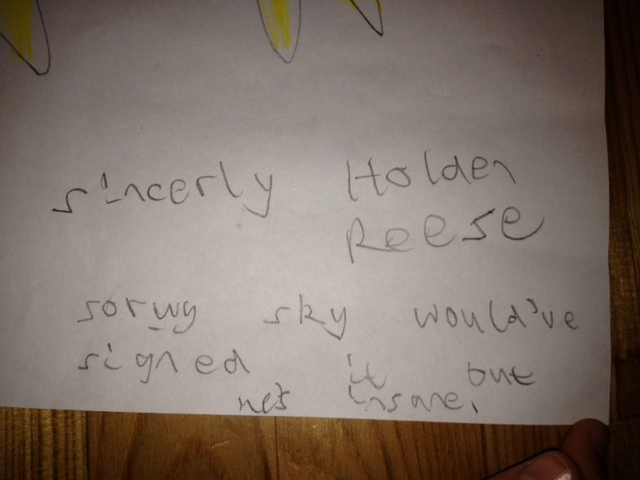 Holden is definitely honest and forthright about his brother. I’m glad I took photos of it! I can’t manage a card – sometimes I’ll have a stickie that reads TO: X Love your friend: Y – nothing says “love” like a post-it note. I’m against cards for some reason. I’m also appalled when people feel compelled to read cards OUT LOUD – especially the mushy ones. I think those things are for reading in one’s mind. My mom-in-law has a calendar and at the beginning of each month she buys all the cards needed for that month. She’s amazing – I’m barely coping. Xmas paper is useful ALL year long! That’s so funny you say that about reading it aloud. I think that, too, especially if you say something really personal. Then it’s, uh, slightly awkward. In the case of my son’s card it wasn’t very funny (even though I thought it was!). I understand all about the Post-It. Like that shouldn’t that be enough? I admire people who are that organized. I tell myself someday I’ll be so organized, but so far it’s not happening, Denise! I always have a little Xmas paper in my closet. Pretty colors, right? Red, green, blue. Who cares! I don’t think being that organized is in my genetic makeup so why fight AGAINST my nature??? Always good enough – that Xmas paper!! I love that card! It’s the best. At some point after being pummeled by all these birthdays (a bajillion invites times five kids= ack!) I managed to make a big gift wrap order online on a sale day. It worked out really well. I also ordered an assortment of cards. When we ran out, I did it again. Only during the life of that order of gift wrap, my kids all moved into the teen years, where they only give each other cash, card unnecessary. Maybe it’s a Jersey thing. I don’t remember going through this in Indiana when I was a kid. At any rate, I’ve managed to use up a lot of the overly juvenile wrapping paper on them for their own birthdays, but man, do I have a lot of cards left. Thanks, JM! I rather like that card myself. I bet you had to be REALLY organized. That must have have been a tone of birthdays!! Ack is right!! I admire you being able to handle all of that. It sounds like you did it with ease! Things are already moving into the gift card exchange. I guess before long it will be cash. I know we didn’t have all this as kids. Maybe I missed out on birthdays I didn’t know about, which in the end of course, doesn’t matter. It’s interesting that things have evolved like this. I’m not sure why. Hey, you can always unload your cards on me! Hahaha totally relate. It was kind of achievable with one baby but now with two and as they grow and I try to add in luxuries like time for my personal development (writing) I am useless. Went to a Christening recently, had to nip to the supermarket btw church and party (for obvious reasons) where we met another four families doing the same thing! Wise choice to make the card. You can spend more on a card and wrapping/bag than a present these days. I’m sorry Skyler is insane but it really does add something to the card. Isn’t that the truth, Michelle? Sadly, I must factor this into the buying equation. I wish I didn’t have to, but that’s life. The homemade card definitely saves a bit. Cards can be a lot, too! They’re like a whole gift these days. I love what Holden said. If you could just hear him say it…I didn’t want to give it up!